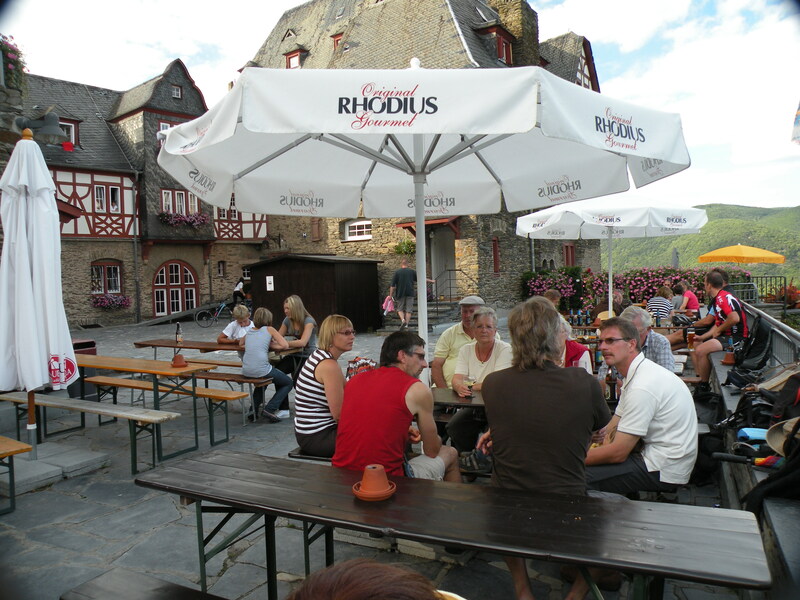 Rough night sleep here at the Malmedy – Hautes Fagnes Hostel. First uncomfortable bed I’ve had on this trip. Guess I’ve been lucky thus far. After leaving the hostel, got fueled up. The gas price in town was 1.26 euros per litre, that’s the best I’ve seen yet. I have paid up to 1.56 euros per litre for diesel. You think you’ve got it tough back home? I’ve been paying $7.50 – $9.25 USD per gallon for diesel, which by the way, is less expensive than gasoline here. I think the government subsidizes it. Use the Google Calculator to see what the USD price per gallon is (go to google.com and type in “1.4 EUR per litre in USD per gallon” without the quotes). I also had to get some cash. ATMs are not as plentiful here as they are back home so it took a while to hunt one down. 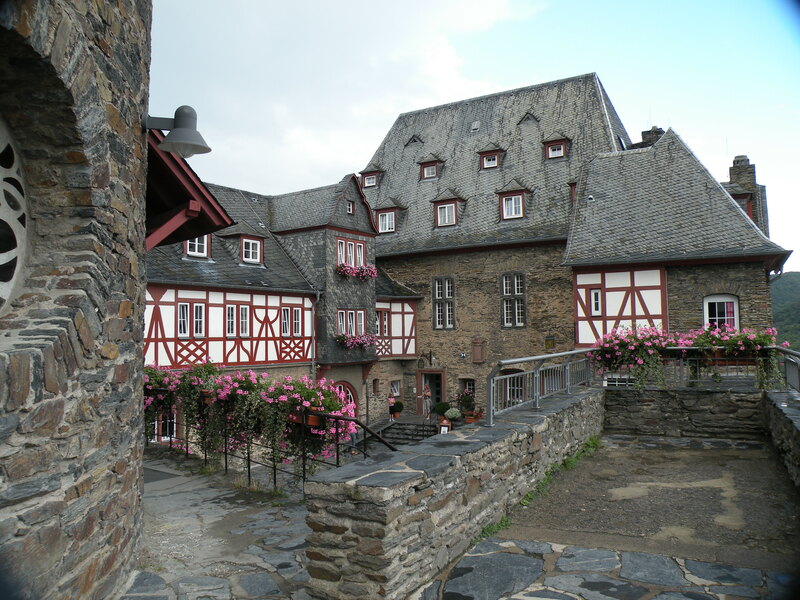 I left Malmedy and headed for Germany. Just before the border, I stopped for a bathroom break. Honestly, I’m not getting so familiar or senile that I want to tell you when I have to go, it’s just that it’s a little unusual in Belgium. There is an attendant at public water closets and you have to pay 30 cents to use the facilities. Sometimes they are right in there with you, to help, I guess. It’s a little weird; no, it’s a lot weird. On the other hand, it’s nice to always have a nice clean toilet to use and one of the sinks usually has flowers in it. 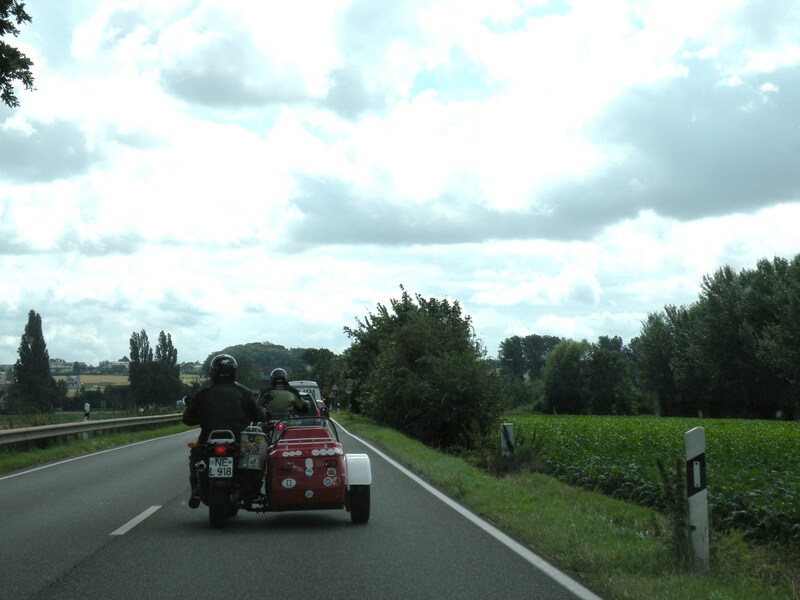 So, I drove into Germany and the way the roads are marked is a little different. I had my route all planned out and at the first opportunity, I got headed off in as wrong a direction as is possible. I pulled over and studied the new Via Micheline map of Germany I just purchased and compared it with the road signs I just encountered. After the light bulb came on, I was on my way. Had a nice drive via country roads from one small village to another. Got stuck behind a wedding procession. After the wedding, apparently the couple gets in their car and drives slowly all through town with their family and friends behind them in their cars, all honking their horns. When they are through with their town, they drive to another town, slowly, and do the same thing there. Oh well, I tolerated it. I’ve noticed one thing about Europeans. They sure tend to be patient. I was waiting in line at the Versailles train station, what seems like months ago, and it was oh so hot. The lady at the front of the line at the ticket window already had her ticket and was trying to do other business and asking a lot questions and there was a long line. The lady behind the window helped her with whatever she needed and everyone in line was patient and didn’t seem to mind… except me of course. I guarantee you, this just wouldn’t do at home. At my first encounter at a toll road, I wound up in the wrong lane and when I pulled up to the booth, no coin basket was to be found. It required some sort of card, some special toll booth card is all I could think. It showed a picture of a white card with a mag strip. I thought maybe you have to buy those in advance or something. Luckily there was a button to push for help, but no one answered. And of course, lots of cars were piling up in back of me. The gate is down, what do you do? I’m freaking cause I’m holding up all these people that are probably in a hurry. Finally an attendant walked over and said I needed a carte, I told her I didn’t have one. She took my coins and did something to the machine to make the gate open and I was on my way. It dawned on me, not one single person behind me honked their horn. Patient people I tell ya, it kind of freaks me out. Then something else dawned on me, it was a credit card. That’s all the they wanted, a credit card. Boy howdy, I felt like an idiot. I tried a credit card at the next booth and it worked just fine; duh. Back to the drive. I passed two or three nuclear plants and four windmill farms. I wonder how much energy those windmills produce. They sure are big. There’s a big nodule that sticks off the back of the center point of the propeller; it looks big enough to be an apartment or office. Although I didn’t see any nuclear plants in France, I’m told they get approximately ¾ of their energy from nuclear. 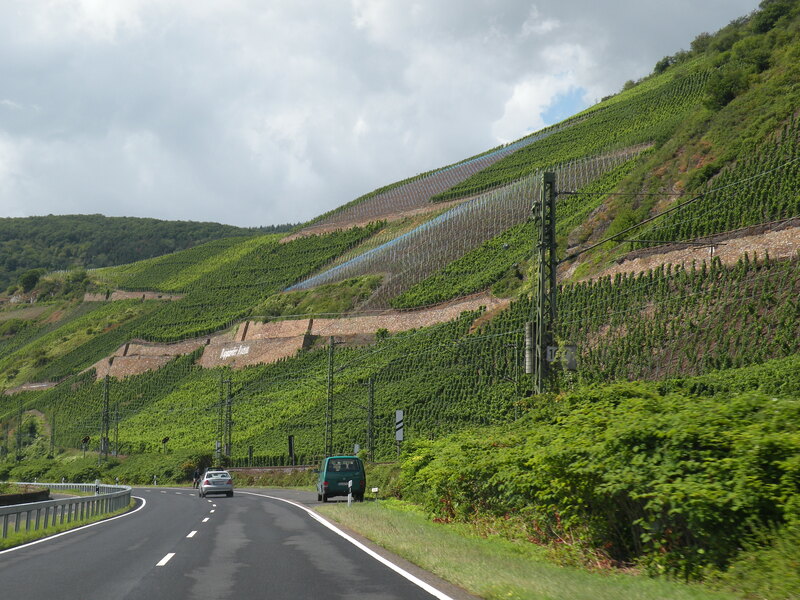 I passed by lots of farmland and vineyards as well. 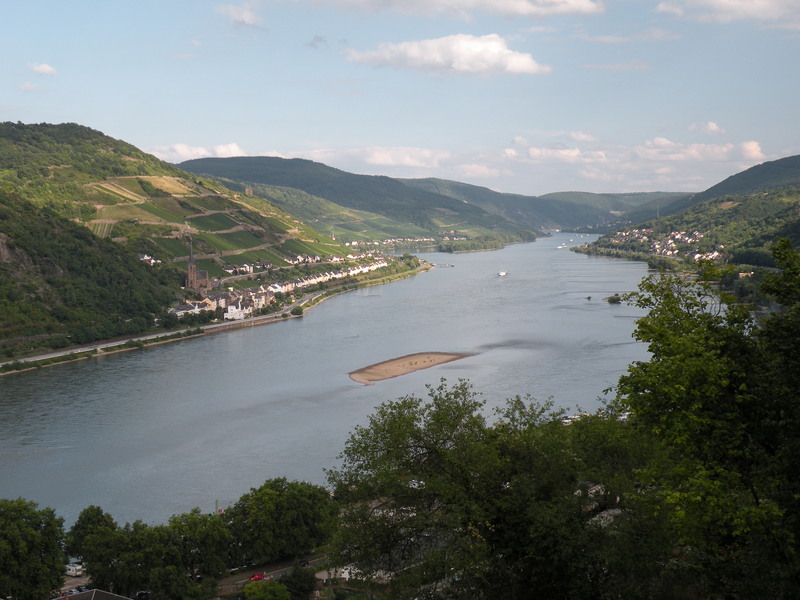 I eventually made it to the Rhine River for the final leg to Bacharach where I would stay the night. Oh my, what a sight. 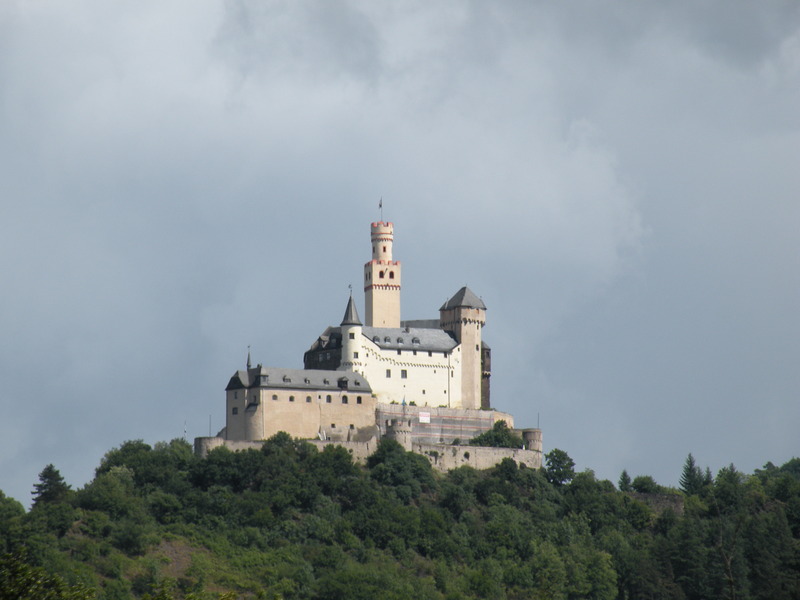 Every few miles, a castle and a postcard village on one side of the river or the other. Just beautiful. It was a pretty day as well. My head was moving rapidly from one position to another, I was trying to take it all in and not miss anything, and take pictures at the same time, and try to keep the car on the road. I know mom, I’ll stop doing that. I made a note of each village I’ll go back to tomorrow to explore. Each place seemed cooler than the last. 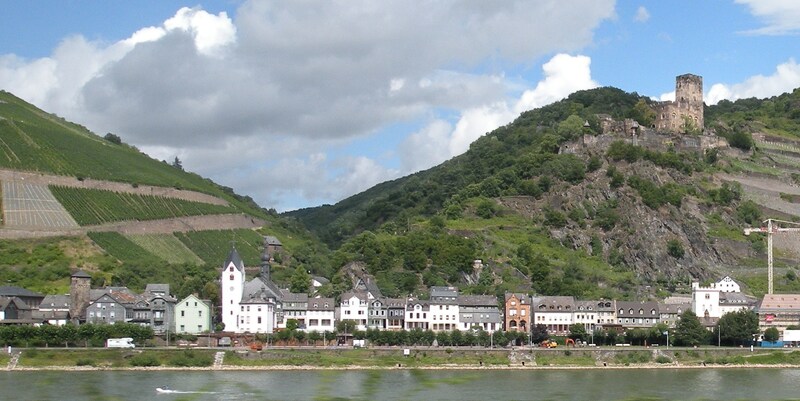 Then I came to St. Goar (Gwar). Wow. 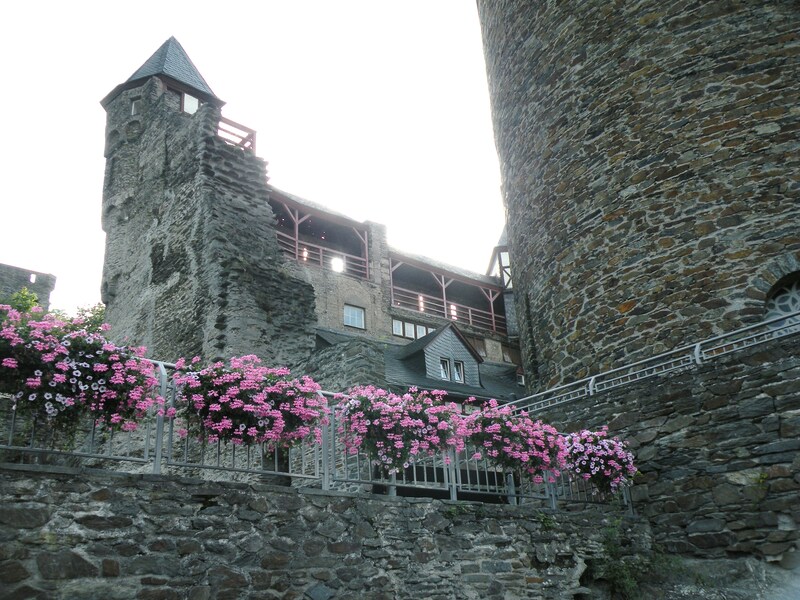 Then I came to Bacharach and I could see my hostel way up on the hill above town, the Hostel Castle Stahleck. To get into town, you turn off the main river road and go through a tiny tunnel (under the train tracks), only wide enough for one car. “No way, you’ve got to be kidding me” I said out loud. I’ll never be able to drive, take pictures, keep an eye on the road, and not hit someone. 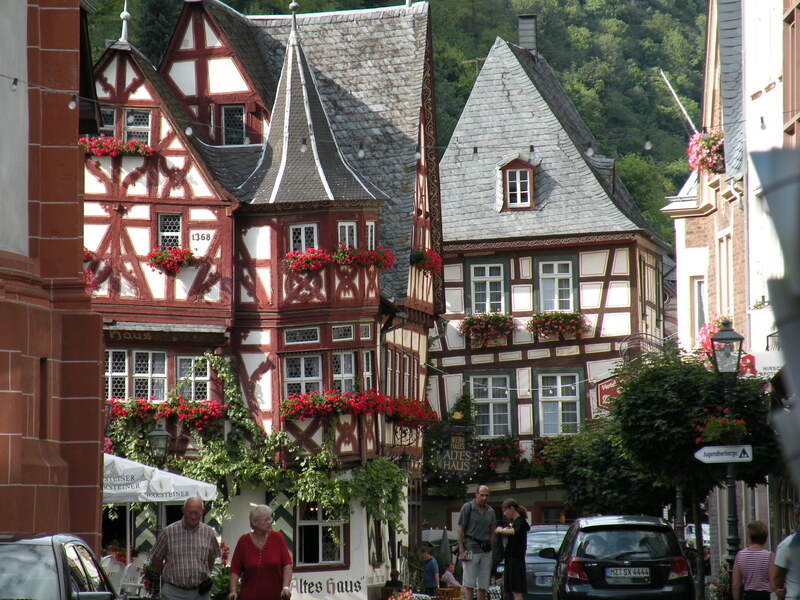 I was in the middle of the most gorgeous little classic fairy tale German town square, it was a whole other world. The cobblestone roads were so small, I thought I wasn’t supposed to be there. There were a couple other cars, so I guess it was OK and I proceeded, very slowly. Some of the roads were so narrow, the pedestrians had to put their backs against the walls of the buildings so I could pass. 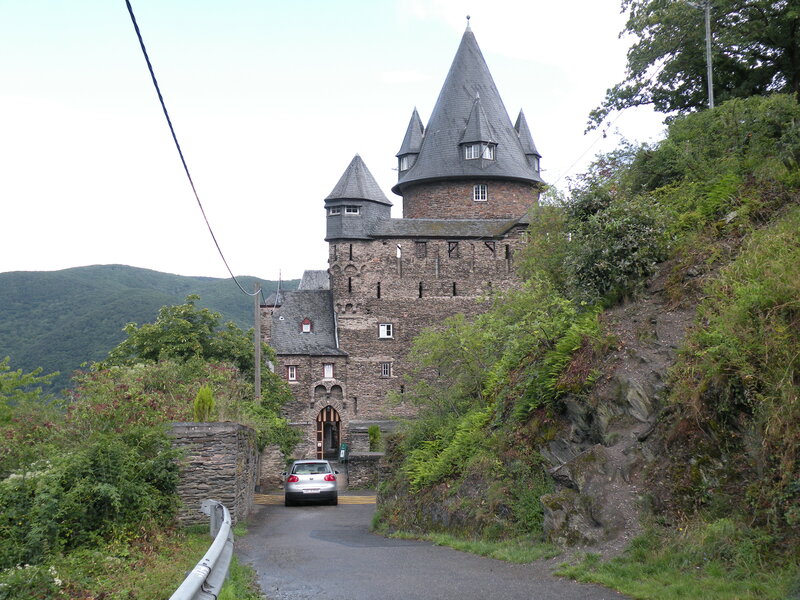 I made it through town OK and up the hill to the Stahleck Castle. Wow, this is a hostel? 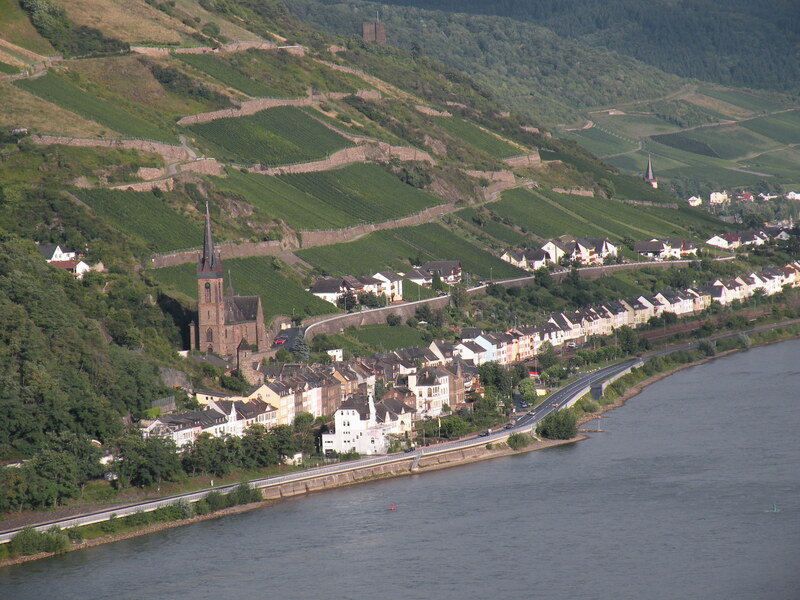 A big castle, great facilities, magnificent view of the Rhine and Bacharach and a couple other towns up river. I got checked in and went exploring. The castle itself is fun to investigate; lots of nooks and crannies. 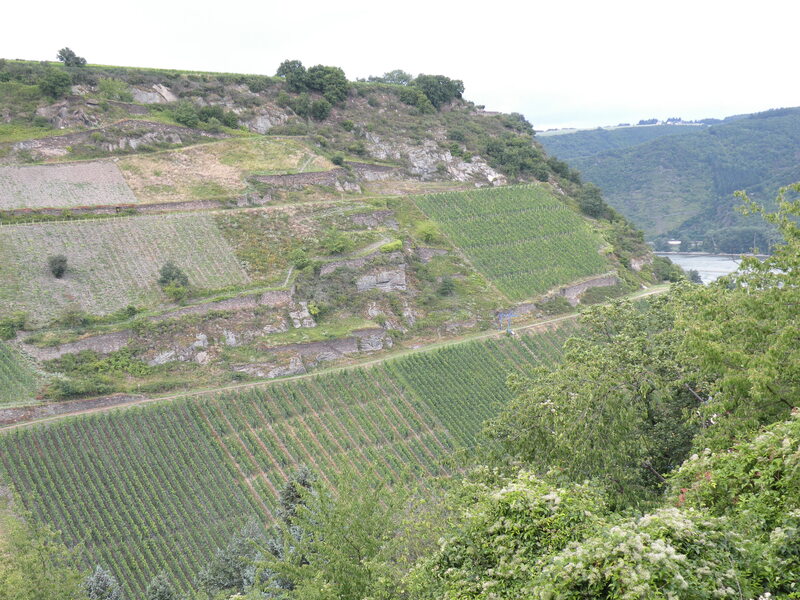 There are trails all around and adjacent to us on the other side of a large ravine are vineyards aligned vertically. So big that if you look straight at them, they fill your peripheral vision. 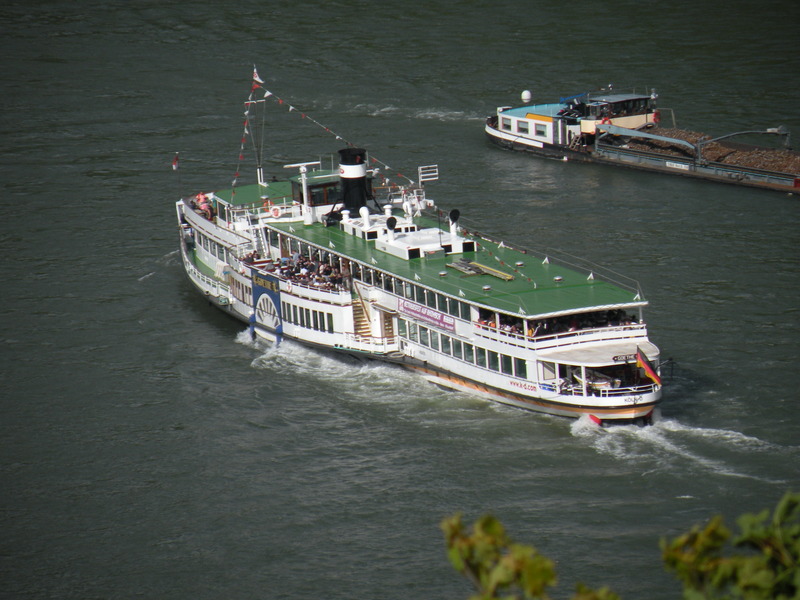 They run up and down the hill which is probably at least 700 feet in altitude from bottom to top. 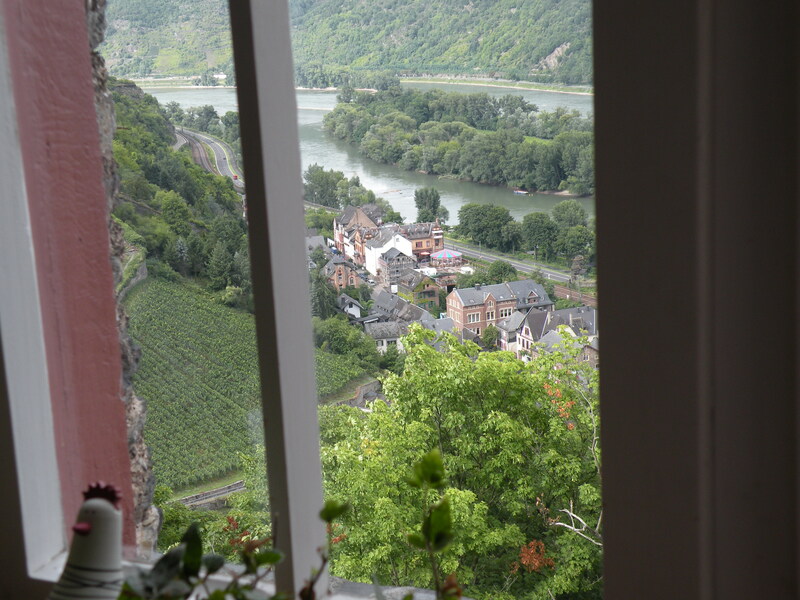 I found a chair by a window that overlooked the river and the town and the most excellent cool breeze was coming in. It had just rained hard for about 20 minutes. The sun was coming out again and so I sat in that chair by the window with the cool breeze and read for a spell and admired the view, and read, and admired the view… It was just another one of those perfect moments. I met Donna and her son Ian and his best friend Jared from the bay area California. We chatted a bit and had dinner together. They’re here for a couple three weeks as a graduation present for Ian. They came in from Köln (Cologne) today. Real nice folks and I enjoyed their company. I headed back to the room to get my book and met a roomie named Sarah who was up reading. She’s from Toronto and is on summer break from her teaching job. She teaches Geography and Science and is on this trip “preparing” materials for the coming year for her kids. Uh huh. It was really nice to talk with folks this evening with familiar accents and from familiar worlds. 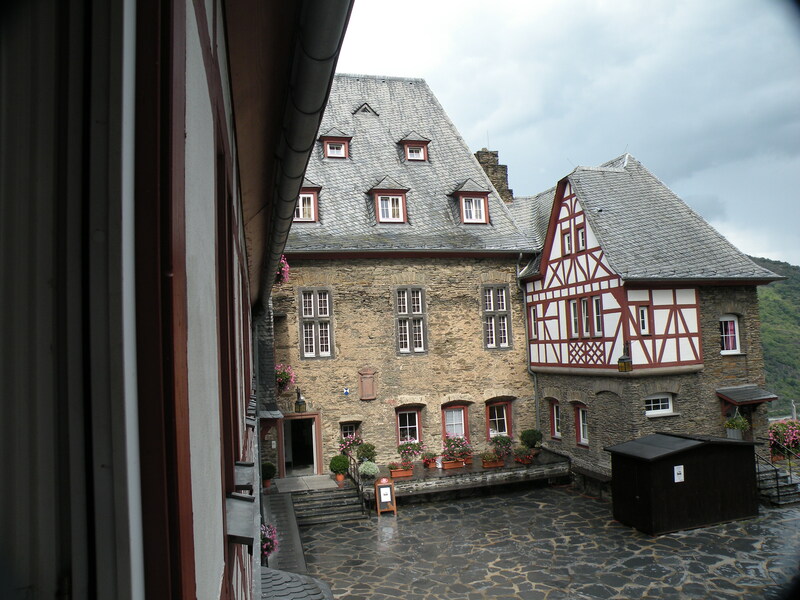 I think I’ll go out in the castle courtyard overlooking the river and read some more till it gets dark. Oh yeah, and I might admire the view too.